Specialist children’s publisher Egmont UK has signed a deal with ITV Studios Global Entertainment’s consumer products division, owner of many classic brands created by Gerry and Sylvia Anderson, to publish many classic Anderson original comic strips in new formats. Egmont has acquired the rights to the classic Thunderbirds comic strips first published in both TV Century 21 and strips originated for the 1990s Fleetway Anderson-related comics, along with other much-loved creations such as Stingray, Joe 90 and Captain Scarlet. They will be published in ‘best of’ gift book format as well as e-books based on the original comic strips. The last collection of Anderson strips - Menace from Space was published by Signum Books in 2011, the last of five volumes in a treasury format (the first four published by Reynolds & Hearn). 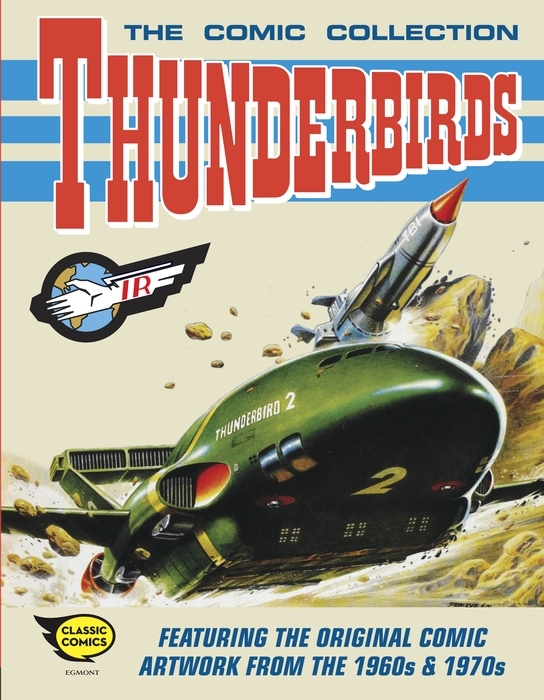 These collections did not include any of the originated material published in Fleetway's 1990s Anderson titles, which focused on one show per title, with Thunderbirds proving the most successful. (Egmont purchased Fleetway in 1991). Demand for Thunderbirds output in particular has reached new heights, boosted by the ITVS GE licensing programme and the imminent fiftieth anniversary of the television series. The classic Thunderbirds name and brand have remained popular and loved for nearly half a century — which will be highlighted in 2015 when Thunderbirds celebrates its 50th anniversary and ITVS GE launches the hotly anticipated new series of this iconic action-adventure show, Thunderbirds are Go! Egmont says the return of these comic strips in modern formats is expected to receive an enthusiastic response from original fans of the groundbreaking series which first went on air in 1965, as well as a whole new audience. The first output from the deal will be available in October this year when Egmont will republish the original 1960s and 1990s Thunderbirds strips both digitally and in special collectable print editions. The Anderson comic strips form part of Egmont’s extensive Classic Comics archive which includes Roy of the Rovers, Battle Picture Weekly, Action, Whizzer & Chips, Misty, Tammy and Jinty. Rights to publication of properties like Thunderbirds are owned by the rights holder - which in Thunderbirds case is currently ITV. I guess this means the end of the Reynolds & Hearn / Signum series ? This is curious as my understanding that it is certainly not Egmont/Fleetway who own the rights to the 1960s TV Century 21 comic art ??? ITV do not hold the art from titles like TV 21. But if you wanted to use that art you would still have to get a license from ITV. If you wanted to use the art held elsewhere, those that hold it might charge a fee for access, in the same way that photo agencies charge for the use of photographs. As someone who contributed a great deal of work to the Anderson titles in the early 1990s under the editorship of Alan Fennell, I'm intrigued as to the © situation for us artists in that context. I know we received royalties for a Dutch edition and I think, for the re-use of the art. I will investigate!